Three and a half months into the year, I'm going along okay with the Expert Challenge, having tried several new authors, and books from or set in several countries. I am currently reading my 13th of 14 novels (Douglas Preston and Lincoln Child’s THE ICE LIMIT, set in Antarctica). 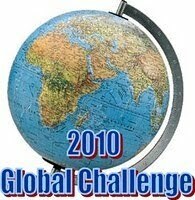 After that I have one more novel from South America to read to complete the challenge. I have however been a little slack on posting reviews thusfar, so have been playing 'catch up', so to speak. So today, I'm looking at A BALI CONSPIRACY MOST FOUL by Shamini Flint - the second book I read for the Asian continent. Shamini Flint is a former lawyer (she worked in Malaysia and Singapore) and now stay-at-home mother, writer, part-time lecturer, and environmental activist living in Singapore. Along with her mystery series starring the unique Inspector Singh, Flint also writes children books with cultural and environmental themes, including JUNGLE BLUES and TURTLE TAKING A TRIP, as well as the ‘Sasha’ series of children’s books. 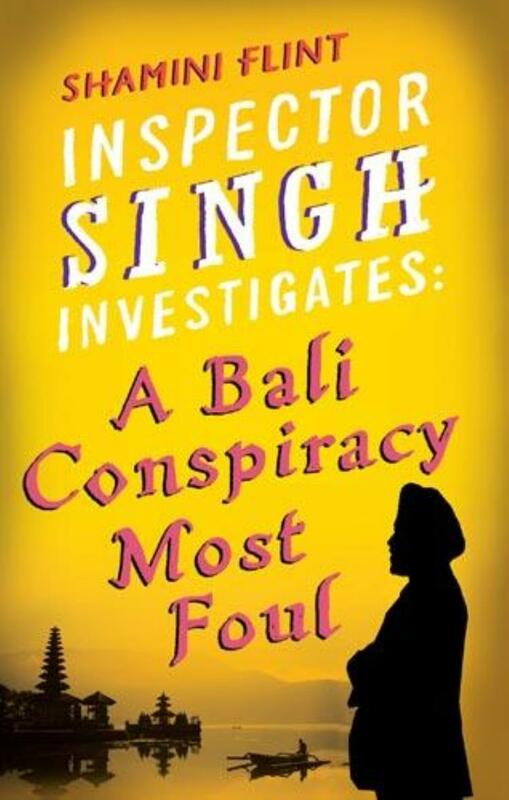 In A BALI CONSPIRACY MOST FOUL, her second in a series featuring irascible and portly Sikh detective Inspector Singh, Flint sets a murder mystery in the debris and aftermath of the horrific real-life ‘Bali bombings’ that devastated the tourist Mecca several years ago. The back cover blurb states: "Inspector Singh is back, but this time on secondment to Bali. A bomb has exploded and Singh has been sent to help with anti-terrorism efforts. But there’s a slight problem: he know squat about hunting terrorists. He’s much better suited to solving murder! I quite enjoyed this book, I must say. The characters and setting are fresh and interesting, and Flint writes well. I was considering a 3 or 3½ star rating for a Good Reading review, but one of my fellow reviewers beat me to the punch (reviewing this book along with Flint’s Inspector Singh debut A MOST PECULIAR MALAYSIAN MURDER in the current, April, issue of Good Reading). There’s a bit of a dichotomy with Flint’s Inspector Singh novels – the brightly-coloured covers, almost comic or cartoonish main character, and ‘light’ writing style bely the fact that the stories deal with some serious issues, and aren’t in any way bloodless cosys. People are blown up, the detectives examine bits of bullet-holed bone, and not every ‘good guy’ character survives the 292 pages. But it’s still a ‘light’ read, in a good way. Enjoyable, definitely. Inspector Singh is an intriguing main character. A food-loving rotund Singapore policeman of Sikh descent, famous for wearing white sports shoes, he has a good record with murder investigations, but is tolerated rather than liked by his superiors, who are more than happy to send him away to Bali to help with the multi-national investigation into the bombings, despite Singh’s complete lack of terrorism expertise. In A BALI CONSPIRACY MOST FOUL, he finds himself paired up with Bronwyn Taylor, a ‘big-boned’ policewoman of the Australian Federal Police that Singh initially finds annoying and tiresome. Taylor has little experience with murder investigations, but like Singh, she has been somewhat sidelined by her superiors – and her and the pot-bellied Sikh find themselves working together to investigate the bullet-holed bones found at the bombsite. A pair of castaways marooned on a murder case seen as largely insignificant by their respective agencies, who have far more important things on their plate - tracking down the culprits behind the horrific nightclub bombings. Singh is kind of a lovable grump; when he’s not plying himself with nasi goreng and Bintang beer, he can be a sharp and shrewd operator in a murder investigation. He often rubs those around him up the wrong way (sometimes as an intentional tactic, sometimes through indifference), but beneath the gruff and irascible exterior he does have some compassion for the true victims. Unlike Taylor, he doesn’t extend any sympathy to those peripheral victims (eg the murdered man’s wife and friends) that could perhaps have actually been involved in some way, at least until he’s completely ruled them out as suspects. Flint creates a nice tension between Singh and Taylor, a begrudging respect mixed with irritation at the other’s different viewpoints and ways of working. She also evokes the setting of Bali well: its tourist-centric nightspots trying to come to terms with the devastating bombing; its friendly local populace; the split between the lives and perceptions of the ex-pat community and the ‘real’ Bali for the native population; the hustle and bustle; the food, sights, sounds, and smells. Overall A BALI CONSPIRACY MOST FOUL, with its grumpy hero and vivid setting, is a welcome addition to the crime and mystery genre. It’s an enjoyable story that isn’t a dark or heavy read, but still has some seriousness to it, amongst the lightness and comedic moments. I will definitely read more of Flint’s Inspector Singh tales. I am looking forward to the third in the series, THE SINGAPORE SCHOOL OF VILLAINY, which is being released in New Zealand soon. Have you read any of Shamini Flint's work? Does this type of setting, or storytelling, appeal to you? Thoughts and comments welcome. Craig - Thanks for this interesting review. I'm not as familiar with the Inspector Singh stories as I'd like to be, but it's refreshing to meet a different kind of sleuth, and the settings are very appealing. Thanks for reminding us of these books : ).